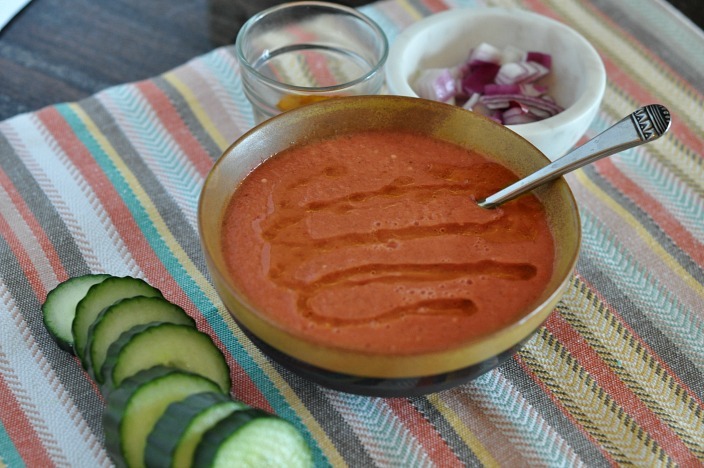 This raw vegan tomato gazpacho is spicy and packed with not only flavor, but hydrating nutrients that help your skin stay soft and supple. I have to admit something. I absolutely hate raw tomatoes. Is anyone else the same way? For some reason when I bake or roast tomatoes and add them with 10 other ingredients, I can handle the flavor. If they’re straight up raw? No effing way. I remember when I was 18 and I was at an old boyfriends house. His mom grew fresh tomatoes in her back yard. Not the big juicy ones, but the small cherry tomatoes. One day we came home from who knows where and she was washing them in her sink. I remember this as bright as day, she turned around, proclaimed her love of her perfect little tomatoes, and popped one in my mouth. I have such an aversion to raw tomatoes that if I accidentally eat one, gag reflexes go into full mode. So I stood there wide eyed with a raw tomato in my mouth nodding at her like a bobble head (I don’t remember why I was doing this) and trying to figure out what to do with this catastrophe that was in my face. I ended up eating it but I’m pretty sure I looked like a koi fish coming up for air. It was not a fond memory. Anyway! I’m sharing this story to emphasize that I really do not like raw tomatoes. So that’s why I was so surprised when I made gazpacho for the first time that I actually enjoyed the flavor. Maybe it’s because there are so many flavors in there that you can’t really taste the raw-ness. 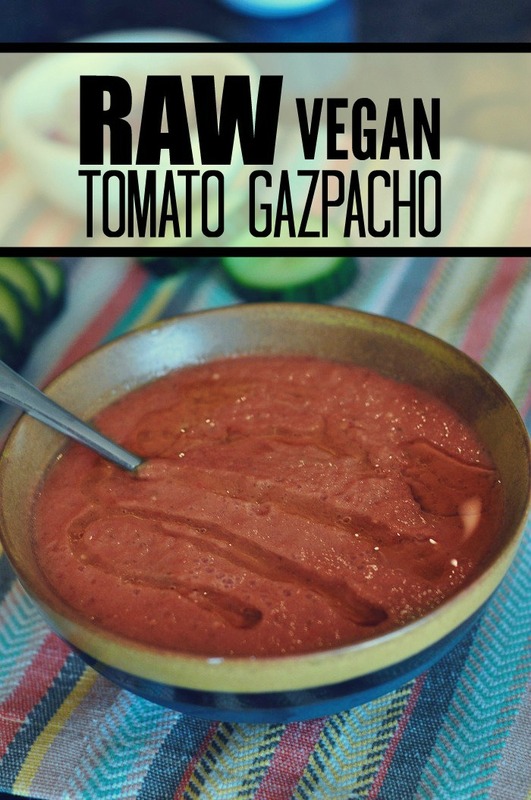 My raw vegan tomato gazpacho is perfect to make in big batches so that you can take bowls to work, or in thermoses on the run, or to simply enjoy throughout the entire week. It’s refreshing and perfect to bring on your summer picnics. My raw vegan tomato gazpacho contains ingredients that are hydrating, has skin-friendly minerals, and are bursting with phytonutrients. There’s fiber from essentially every single ingredient, Vitamin C & E from the bell pepper, immune boosting vitamins and minerals from the tomatoes, and hydrating minerals like silica from the cucumber. It’s all around a fabulous nutrient dense recipe.